AlexaClientSDK: What is the Alexa Voice Service (AVS)? What is the Alexa Voice Service (AVS)? 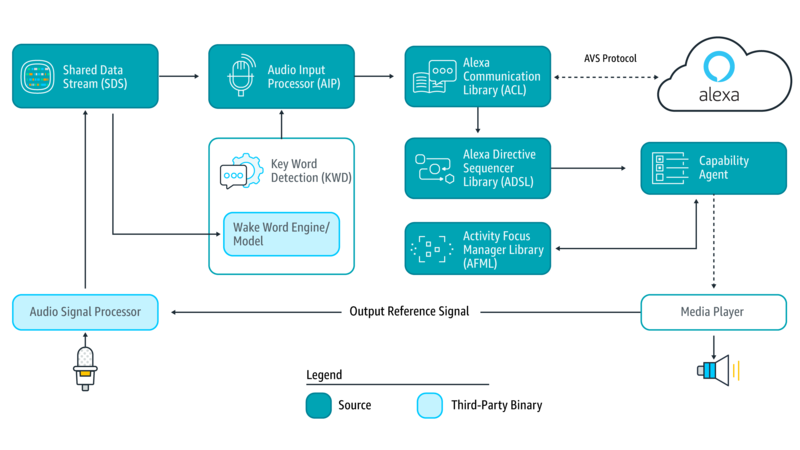 The Alexa Voice Service (AVS) enables developers to integrate Alexa directly into their products, bringing the convenience of voice control to any connected device. AVS provides developers with access to a suite of resources to quickly and easily build Alexa-enabled products, including APIs, hardware development kits, software development kits, and documentation. The AVS Device SDK provides C++-based (11 or later) libraries that leverage the AVS API to create device software for Alexa-enabled products. It is modular and abstracted, providing components for handling discrete functions such as speech capture, audio processing, and communications, with each component exposing the APIs that you can use and customize for your integration. It also includes a sample app, which demonstrates the interactions with AVS. Or if you prefer, you can start with our SDK API Documentation. Watch this tutorial to learn about the how this SDK works and the set up process. This diagram illustrates the data flows between components that comprise the AVS Device SDK for C++. Audio Signal Processor (ASP) - Third-party software that applies signal processing algorithms to both input and output audio channels. The applied algorithms are designed to produce clean audio data and include, but are not limited to acoustic echo cancellation (AEC), beam forming (fixed or adaptive), voice activity detection (VAD), and dynamic range compression (DRC). If a multi-microphone array is present, the ASP constructs and outputs a single audio stream for the array. SDS is implemented atop a ring buffer on a product-specific memory segment (or user-specified), which allows it to be used for in-process or interprocess communication. Keep in mind, the writer and reader(s) may be in different threads or processes. Wake Word Engine (WWE) - Software that spots wake words in an input stream. It is comprised of two binary interfaces. The first handles wake word spotting (or detection), and the second handles specific wake word models (in this case "Alexa"). Depending on your implementation, the WWE may run on the system on a chip (SOC) or dedicated chip, like a digital signal processor (DSP). Audio Input Processor (AIP) - Handles audio input that is sent to AVS via the ACL. These include on-device microphones, remote microphones, an other audio input sources. The AIP also includes the logic to switch between different audio input sources. Only one audio input source can be sent to AVS at a given time. Establishes and maintains long-lived persistent connections with AVS. ACL adheres to the messaging specification detailed in Managing an HTTP/2 Connection with AVS. Provides message sending and receiving capabilities, which includes support JSON-formatted text, and binary audio content. For additional information, see Structuring an HTTP/2 Request to AVS. Alexa Directive Sequencer Library (ADSL): Manages the order and sequence of directives from AVS, as detailed in the AVS Interaction Model. This component manages the lifecycle of each directive, and informs the Directive Handler (which may or may not be a Capability Agent) to handle the message. Activity Focus Manager Library (AFML): Provides centralized management of audiovisual focus for the device. Focus is based on channels, as detailed in the AVS Interaction Model, which are used to govern the prioritization of audiovisual inputs and outputs. Channels can either be in the foreground or background. At any given time, only one channel can be in the foreground and have focus. If multiple channels are active, you need to respect the following priority order: Dialog > Alerts > Content. When a channel that is in the foreground becomes inactive, the next active channel in the priority order moves into the foreground. Focus management is not specific to Capability Agents or Directive Handlers, and can be used by non-Alexa related agents as well. This allows all agents using the AFML to have a consistent focus across a device. Alerts - The interface for setting, stopping, and deleting timers and alarms. AudioPlayer - The interface for managing and controlling audio playback. Bluetooth - The interface for managing Bluetooth connections between peer devices and Alexa-enabled products. DoNotDisturb - The interface for enabling the do not disturb feature. EqualizerController - The interface for adjusting equalizer settings, such as decibel (dB) levels and modes. InteractionModel - This interface allows a client to support complex interactions initiated by Alexa, such as Alexa Routines. Notifications - The interface for displaying notifications indicators. PlaybackController - The interface for navigating a playback queue via GUI or buttons. Speaker - The interface for volume control, including mute and unmute. SpeechRecognizer - The interface for speech capture. SpeechSynthesizer - The interface for Alexa speech output. System - The interface for communicating product status/state to AVS. TemplateRuntime - The interface for rendering visual metadata. Protect configuration parameters, such as those found in the AlexaClientSDKCOnfig.json file, from tampering and inspection. Protect executable files and processes from tampering and inspection. Protect storage of the SDK's persistent states from tampering and inspection. Your C++ implementation of AVS Device SDK interfaces must not retain locks, crash, hang, or throw exceptions. Use exploit mitigation flags and memory randomization techniques when you compile your source code, in order to prevent vulnerabilities from exploiting buffer overflows and memory corruptions. Review the AVS Terms & Agreements. The earcons associated with the sample project are for prototyping purposes only. For implementation and design guidance for commercial products, please see Designing for AVS and AVS UX Guidelines. Contact Sensory for information on TrulyHandsFree licensing. Contact KITT.AI for information on SnowBoy licensing. IMPORTANT: The Sensory wake word engine referenced in this document is time-limited: code linked against it will stop working when the library expires. The library included in this repository will, at all times, have an expiration date that is at least 120 days in the future. See Sensory's GitHubpage for more information. Note: Feature enhancements, updates, and resolved issues from previous releases are available to view in https://github.com/alexa/alexa-client-sdk/blob/master/CHANGELOG.md "CHANGELOG.md". Fixed a bug where the same URL was being requested twice when streaming iHeartRadio. Now, a single request is sent. Corrected pause/resume handling in ProgressTimer so that extra ProgressReportDelayElapsed events are not sent to AVS. Music playback history isn't being displayed in the Alexa app for certain account and device types. On GCC 8+, issues related to -Wclass-memaccess will trigger warnings. However, this won't cause the build to fail and these warnings can be ignored. When network connection is lost, lost connection status is not returned via local TTS. ACL may encounter issues if audio attachments are received but not consumed. SpeechSynthesizerState currently uses GAINING_FOCUS and LOSING_FOCUS as a workaround for handling intermediate state. These states may be removed in a future release. The Alexa app doesn't always indicate when a device is successfully connected via Bluetooth. Connecting a product to streaming media via Bluetooth will sometimes stop media playback within the source application. Resuming playback through the source application or toggling next/previous will correct playback. When a source device is streaming silence via Bluetooth, the Alexa app indicates that audio content is streaming. The Bluetooth agent assumes that the Bluetooth adapter is always connected to a power source. Disconnecting from a power source during operation is not yet supported. On some products, interrupted Bluetooth playback may not resume if other content is locally streamed. make integration is currently not available for Android. In order to run integration tests on Android, you'll need to manually upload the test binary file along with any input file. At that point, the adb can be used to run the integration tests. On Raspberry Pi running Android Things with HDMI output audio, beginning of speech is truncated when Alexa responds to user text-to-speech (TTS). When the sample app is restarted and the network connection is lost, the Reminder TTS message does not play. Instead, the default alarm tone will play twice.